New York, NY – April 23, 2011 – Betty Cuningham Gallery is pleased to announce an exhibition of paintings by Beverly McIver. A recent addition to the gallery’s roster, McIver will be having her first exhibition at the gallery, located at 541 W. 25th St, between 10th and 11th Aves. The artist will be present for an opening reception on Thursday, May 19; the exhibition will be on view through Friday, July 1. Included in the exhibition will be approximately 12 paintings. Characteristically all of McIver’s paintings are autobiographical. This exhibition focuses particularly on three themes: McIver’s defining self-portraits, McIver’s sister, Renee, and McIver’s paintings of the interactions between her sister and herself. As a child I had dreamed of becoming a clown, to escape my black skin, poverty and the housing project I once called home. Clowning was my disguise, my liberation. In her earlier self-portraits she portrays herself in clown-like white-face and later in black-face. 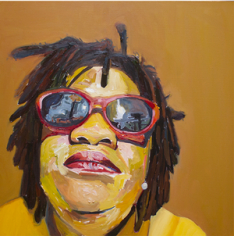 While in the self portraits in this exhibition, she removes all masks, in the Depression Series and in Happy Times, as she struggles to find herself as an artist, an African-American woman, and as the caring sister of Renee. The second theme “Raising Renee” is a series which began following the death of the artist’s mother in 2004 when McIver inherited the responsibility of taking care of her oldest sister, Renee, who is mentally disabled. The paintings document the past seven years of McIver’s struggle to adapt her life to becoming a caretaker to her sister, a role which McIver says is her “toughest challenge to date”. The two triptychs in the exhibition, Renee Drinking Starbucks (Triptych), 2011 and Renee in Bathtub (Triptych), 2011 reveal McIver’s challenge. And the third theme, the interaction between the two sisters, captured in Embrace, 2005, and Me and Renee Dancing, 2004, bares McIver’s deepest emotions in her life and in her work. In December of 2011, HBO will air a feature length documentary about the life and painting of Beverly McIver, titled Raising Renee, directed and written by Jeanne Jordan and Steven Ascher, and produced by West City Films. McIver’s work can be found in a number of public collections, including the Baltimore Museum of Art, Baltimore, MD; the Crocker Art Museum, Sacramento, CA; Duke University, Durham, NC; the North Carolina Museum of Art, Raleigh, NC; and the Weatherspoon Art Museum, Greensboro, NC. 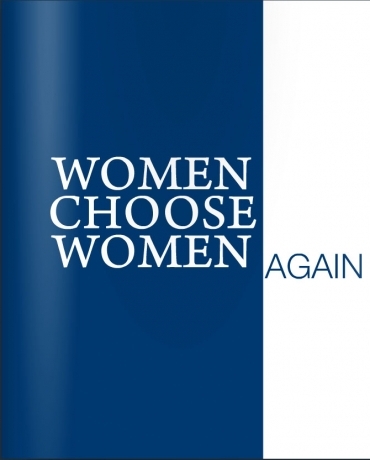 She has been the recipient of numerous awards and fellowships, most notably the Louis Comfort Tiffany Award, 2003-04; Marie Walsh Sharpe Fellowship, 2003; Radcliffe Fellowship from the Radcliffe Institute for Advanced Study at Harvard University, 2002; Creative Capital Grant, 2002; John Simon Guggenheim Fellowship, 2001; Anonymous Was A Woman Grant, 2000; and North Carolina Arts Council Visual Artist Fellowship, 1994. 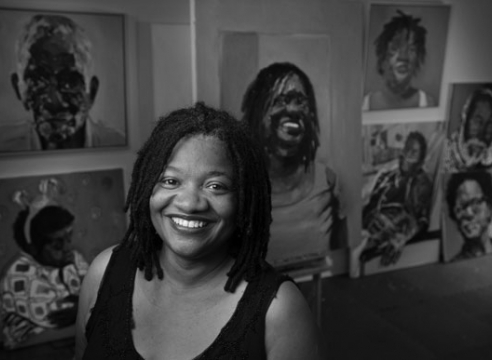 Beverly McIver was born in Greensboro, NC and received a BA in Painting and Drawing from North Carolina Central University and a MFA in Painting and Drawing from Pennsylvania State University. In 2007 she received an Honorary Doctorate from North Carolina Central University and has been a Professor of Art there since the same year. The artist lives and works in Durham, NC. New York City's Betty Cunningham Gallery will open the first show of its 2016 fall season right after Labor Day. 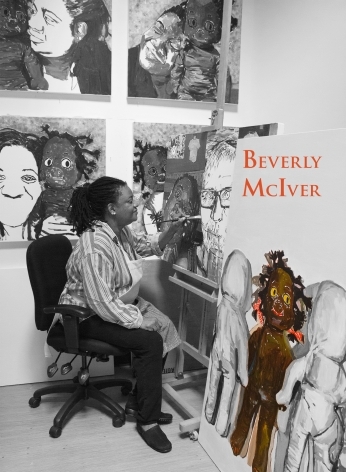 The artist: Beverly McIver. Bevery McIver is a powerful force in contemporary American art. She applies an impasto of primary oil colors onto canvas to vividly express the emotions of her portrait subjects. Often it is the face of a family member, friend or herself that McIver paints to explore the human psychological struggle for racial and gender identity. Her work has been reviewed by the New York Times, and in 2011, Art in America magazine recognized her as one of the "Top Ten in Painting".